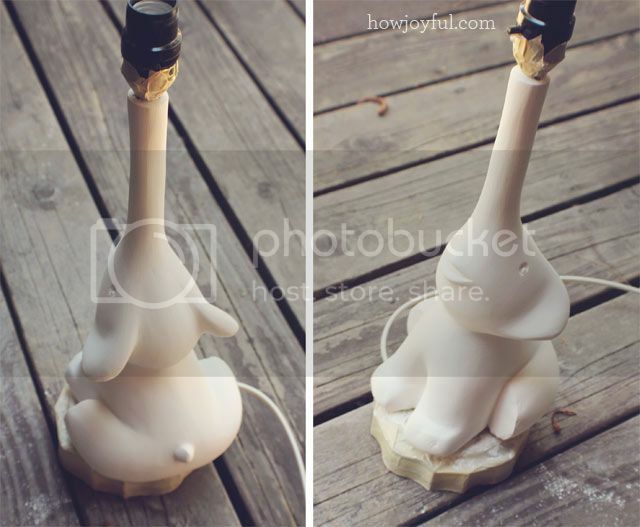 This is my first Nursery project, a fully DIY Elephant lamp. When researching for inspiration for the nursery I found this amazing lamp by Jonathan Adler. 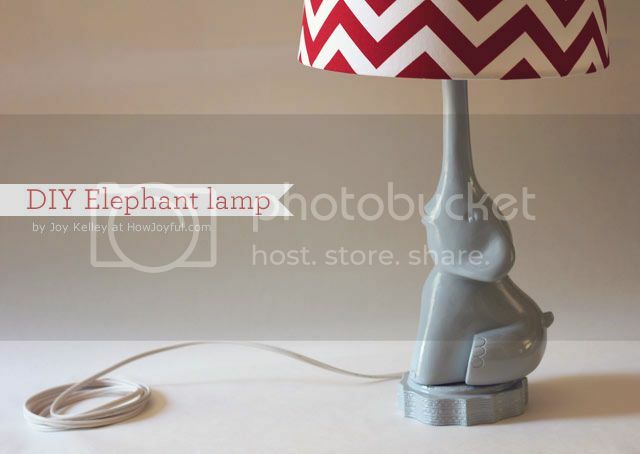 It was just like what I wanted, with only one downfall the price-tag is $395.00 – So very quickly I had to forget about it, instead I planned to make my own version of an elephant lamp. I wanted mine to be gray instead of white, and with more details than the Jonathan Adler's version. 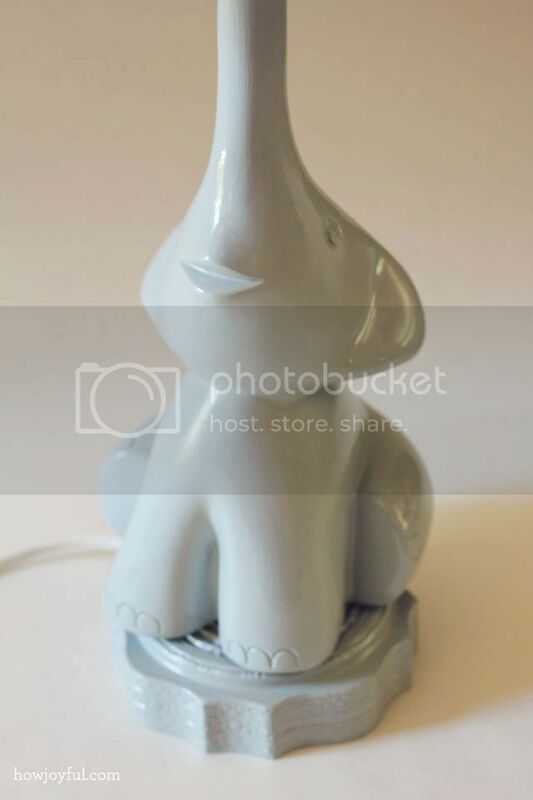 I wanted my elephant to be in a slightly different position and even tho at first I didn't plan for it to have a pedestal, the $5 thrift store lamp I got (to use the socket and structure) worked perfect and I kept the pedestal to give it a little bit more height. 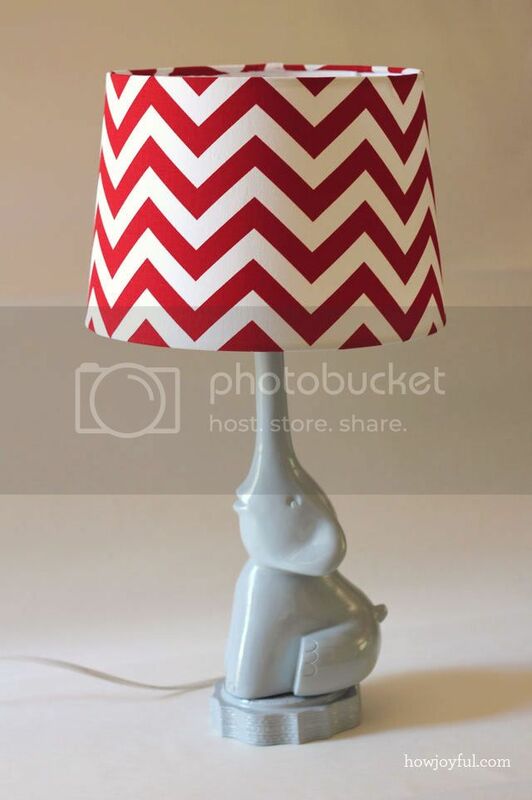 I paired the lamp with a lampshade I recovered with a chevron pattern in red and white. I just love the way the colors mix together =] so now, let me show some more images of the finished lamp so I can also share how I made it! I didn't set this post as a tutorial because I mostly free hand shaped everything, I didn't follow any pattern or image, so it would be too hard for me to explain how to make one, but if you feel creative I can share the materials I used and what my thoughts were, who knows maybe this can inspire someone else so try something similar, right? 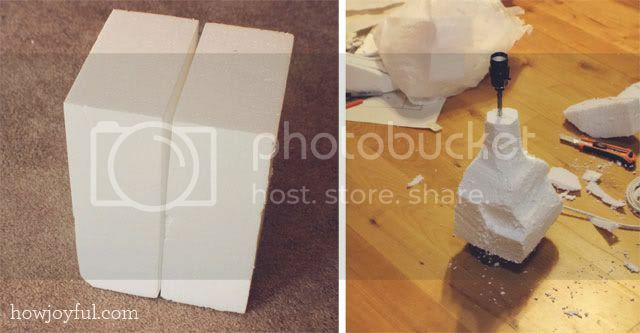 I started with a thrift store lamp that I replaced the cord because it was pretty bad, the lamp only had a tube from the base to the socket, so it worked prefect for me to glue my 2 rectangles of styrofoam (I got the styrofoam from the packaging of our new couch, but you can get any shape of styrofoam at craft stores), I carved a little round shape on the center of my styrofoam so that the tube could be placed there and glue it with silicone (I've found that silicone works wonders when gluing styrofoam to other surfaces, in this case metal) I wrap everything tight and let it dry for at least a day. 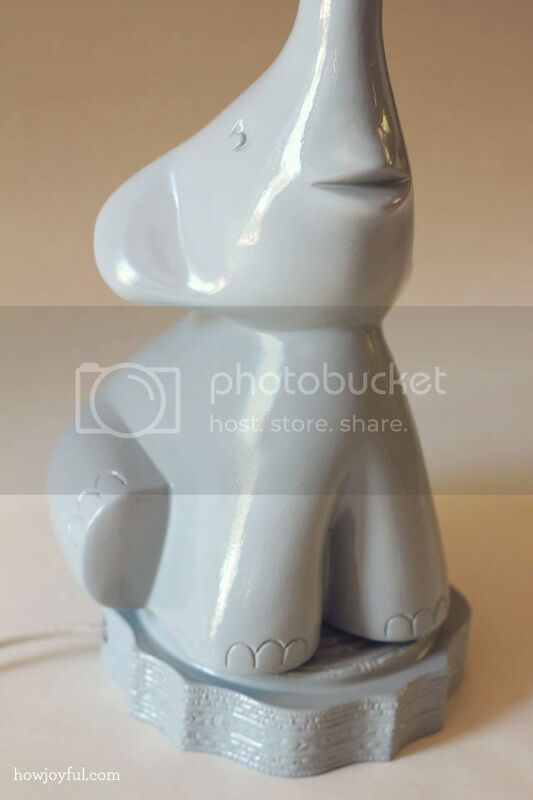 My next step was to sand and give a more detailed shape to the elephant using sand paper, I used an 80grt first for all the shaping and a 120grt for the details. Then I had to test my patience when adding layers and layers of wall mud (drywall compound), I first applied the first 3 layers just using my hands. The only problem with this is that you have to apply a layer, let it dry and then go with the next, so I would do one in the morning and one in the afternoon. 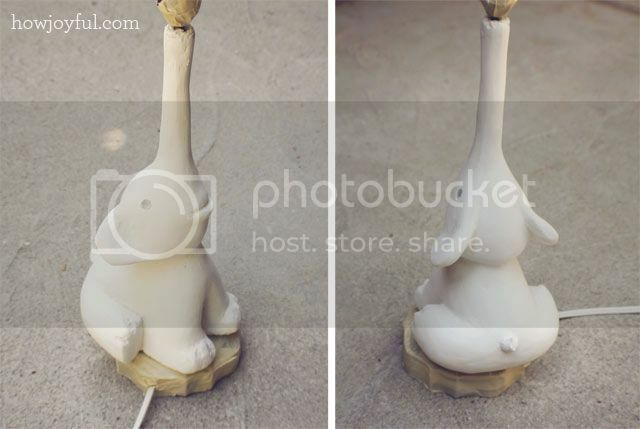 The above pictures show how the elephant looked after the first 3 layers. I sanded the elephant using a wall mud mesh, I sanded before applying the next layer so that the build up would be as even as possible, that way the whole elephant would have a thick layer over it. I used a brush to apply the mud after the first 3, because that would give me a smoother surface that didn't require much sanding. Above you can see how the elephant looked like after probably 9 or 10 thin layers. I did the mouth and eyes by carving the wall mud, and building it up with a thin brush, I used a 400grt sand paper form here on because it's very smooth. I did 2 different kind of feet, because I wanted to see how they look in order to decide, I did a very minimalistic ones for the back and a very thick ones for the front. After staring at them for a long time and with the help of Ken, we decided we both liked the back feet way better than the front, and even tho the elephant was almost done, I decided to rip the front ones out and work with some more mud to shape them just like the front ones. I had to give the front legs about 8 more layers to be able to build them up to the shape I wanted, so finally after a long wait (I had to let it dry longer after each layer because I used way thicker layers this time) it was time to sand with a little bit of water, so that the surface would be all smooth and nice for the paint! For the paint I just went with a gloss spray paint, I painted very thin layers but lots of them so that the coverage was better =] it was a long process, just because of al the drying but I think it was very worth it, after all our baby will have a one of a kind lamp, and mommy only paid $5 for the lamp and about $20 for the wall mud, sand mesh and paper, paint and new wire. I am so excited to move to the next project and start to put the nursery together =] I am almost done with the office, so as soon as I finish here I can start full nursery mode! I hope you all have a wonderful weekend! I have a couple of very cool post for next week so see you then! What a talented woman you are! I love the Idea of sculpting with Styrofoam and mud! You have inspired me to attempt a project of my own! Wow! You did a great job! You should start selling these. :D I can’t wait to see the nursery put together. Well first of all, I am AMAZED that you had the patience for this project. So talented!! If you ever have time with all of your preparations, I would love to see how you went about recovering the shade, too. You are always so precise, and my re-hab jobs never turn out with quite the precision that you bring. Joy you are AMAZING!!!! That lamp is priceless.. The nursery will be awesome. Joy, this is incredible!! I want to commission one from you – thoughts?! Seriously! WOW! That was incredible!! I’d love to hear more about this wall mud. Is that what they use on drywall joints? Where do you buy it? I don’t think I’d ever have the skill for something like this but it’s incredible to read about! That is amazing! It totally looks ceramic. I can see myself trying this with Fimo/Sculpey/modelling clay :) Thanks for sharing! OH. MY. GOSH. This is the coolest lamp I’ve ever seen! I cannot believe you made this! Sheer talent! I really want to try this…I just don’t know if I can do this free hand…. Wow. I’m officially your biggest fan! Unbelievable! You are so talented; it’s gorgeous! Yours turned out way better, at least in my opinion. I love the animated look of your elephant vs the more abstract looking one of Adler’s. Awesome job! Oh my goodness that is so cute! I read this whole post with my mouth open because I cannot believe how you made it. This is so beautiful. I’m impressed by this project and your whole blog. With best wishes for sunny days and smiling. There is just no way you turned styrofoam into this! I am in complete shock and awe. Joy, this is absolutely beautiful and you are so talented! The sculpting alone is amazing, but to get that nice, smooth finish is unbelievable! Love, Love, Love it. OMG! Yours is way more beautiful than the one you took the inspiration!! You really should think about sell them, seriously! Your lamp is a work of art and worth more than the one you used as inspiration. Hand made and fashioned with love…how can it get any better than that! You are truly blessed with a great gift of creativity in craft and vision. I LOVE THIS!!!! 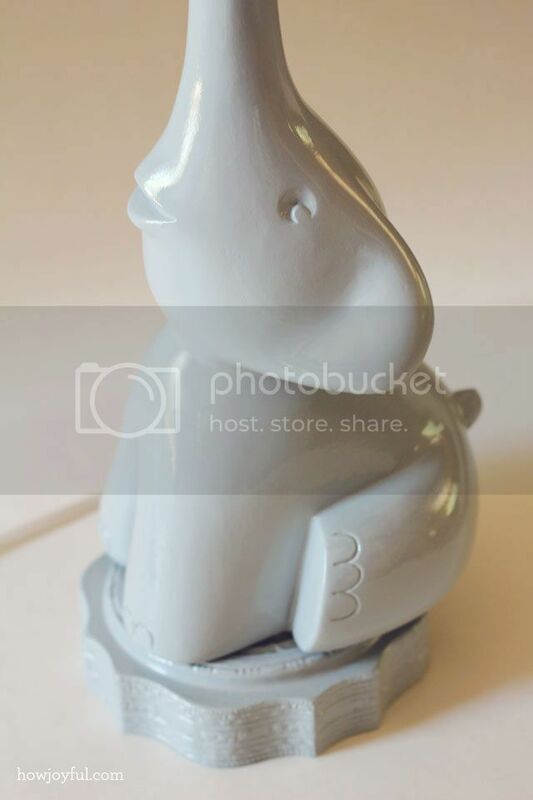 I have been trying to figure out how to make a frog lamp for my sons nursery. I couldn’t decide on frogs or a cowboy theme so I went with a frog cowboy. Just can’t seem to find the perfect lamp…now I’ll make one!!! Thank you so much for posting this!!!! Wow! Just wow! Your lamp is amazing AND adorable! That is an incredible lamp!! I love it. This is simply AMAZING!!! You are so clever and talented, and incredibly patient too. Thanks much for sharing!! You are an amazingly gifted and talented gal! WOW! The lamp is gorgeous! And…I like it better than the JA one. This is amazing! 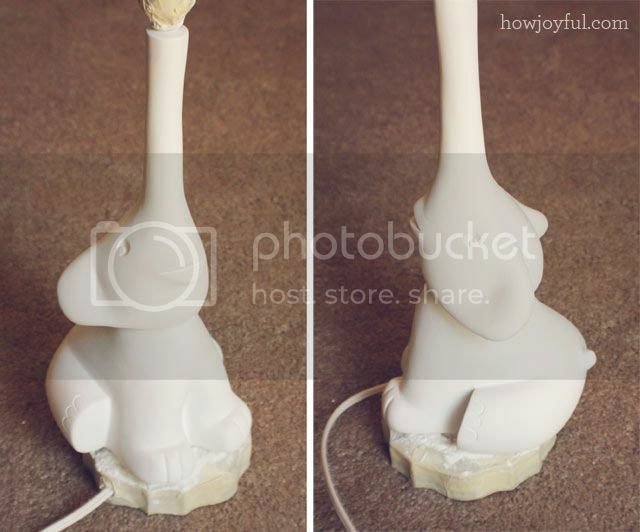 I can’t believe, although I saw that you did, make this adorable lamp from a styrofoam base! By the way, you rock! Wow, this is amazing!! Definitely a labor of love. :) I can’t believe that your carved this out of styrofoam, it looks like ceramic in the pics. Awesome job! That is INCREDIBLE! So, so, so adorable. You are a very talented lady! That is the most amazing thing I have ever seen! I just love this lamp. You have done a remarkable job. You should go into business. Like you have time? Totally, utterly amazing. I read this post with my jaw on the keyboard! Fabulous! Joy – this is SO incredible!! Wow! I absolutely love it! You should be so proud. It looks fantastic. Adorable and fun, and wow, I can’t believe you made this from scratch! HOLY CRAP. That is AMAZING looking. It looks store-bought for sure. 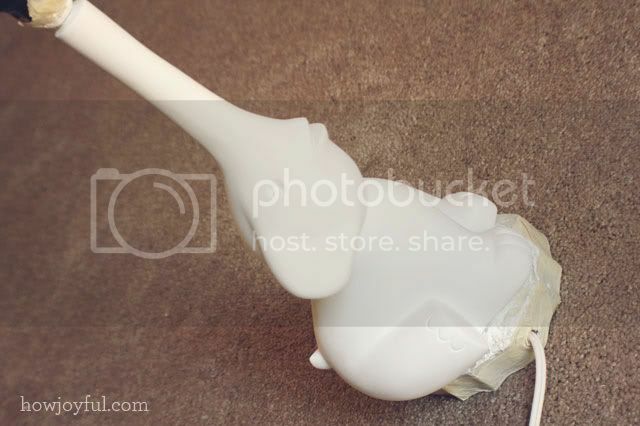 It’s going to be a lamp your baby will treasure forever. I can’t believe what I have just seen, it is so incredible that there is Styrofoam under that shinny glossy ceramic like surface. I cannot believe you can do such wonders with wall mud, this is such a fantastic and skilled work. My sincerest congratulations. Amazing,and so much prettier than the original. Nunca comento ninguna de tus publicaciones, aunque las leo todas, pero esta me mató de amor! pensé que habías comprado el elefante y habías ensamblado las partes pero cuando ví que lo tallaste UAU!!! Felicitaciones x 500.000!! hermosa! WOW. This is so fabulous! Hola Joy, tu eres una artista y haces unas cosas muy bellas. Respecto a tu pregunta, Quien nos inspira para hacer cosas que nunca habíamos hecho? Pues, nuestros hijos. Yo, nunca había cortado ni cocido, pero la llegada de mi bebé me inspiro mucho. de hecho le quise hacer como porta pañales la weekender bag de Amy Butler, pero se me dificultaba comprar el patrón desde Venezuela, y con mucha paciencia,amor, inspiración y conocimientos de dibujo técnico puede hacer mi patrón y quedo precioso. Felicitaciones por el bebe, te espera un mundo lleno de aventura!. P.S. Se que eres chilena y por eso escribo en español. Your creation is beautiful! And I do like yours better than the inspiration! You are a talented, talented lady, and you could sell these if you chose, if only it weren’t so labor-intensive! Keep using your God-given skills! WOAH! This is amazing! 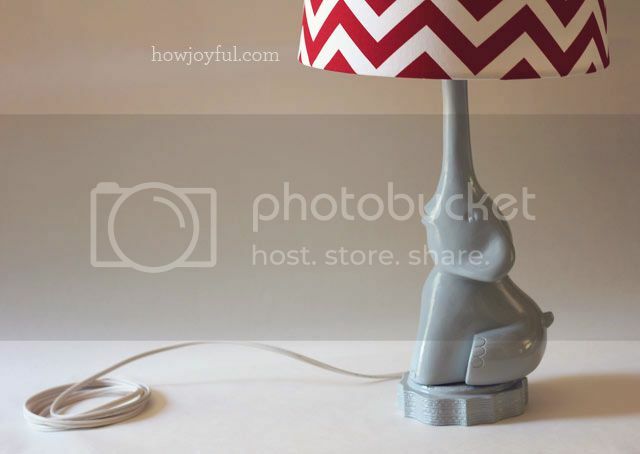 You are super talented because a normal person would not be able to make this detailed lamp. Great job again! Having worked with both styrofoam and mud (and not enjoying either–has to do with the messiness factor), I’m quite impressed. Excellent job! 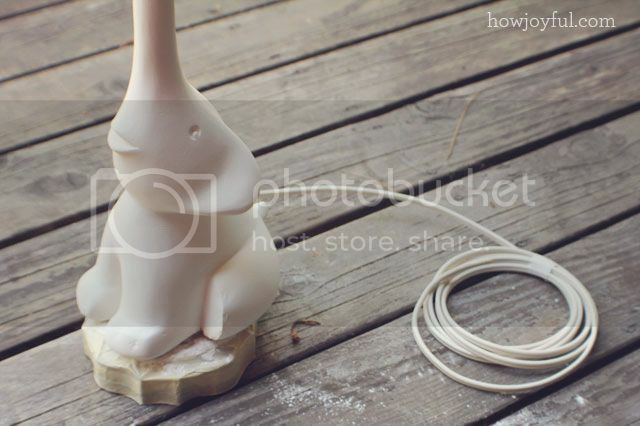 Your elephant is adorable, and it does really look like porcelain. I will be pinning this for future reference! I looked up Adler’s lamp and yours is way cuter. I would buy yours before his! Oh my, that is an incredible project! It looks designer wonderful!! Lucky baby! I am totally in love with this project – and very jealous of your talent. I’m pretty sure I couldn’t do this diy, but you made it look amazing! This is ridiculously amazing. I am seriously impressed with your talent! Sharing this on my FB wall!! wow, just wow. Extremely impressed with this project! You did such a GREAT job on this! It looks amazing! If i ever get the time/ confidence i’m so trying this – thank you! You are so talented! 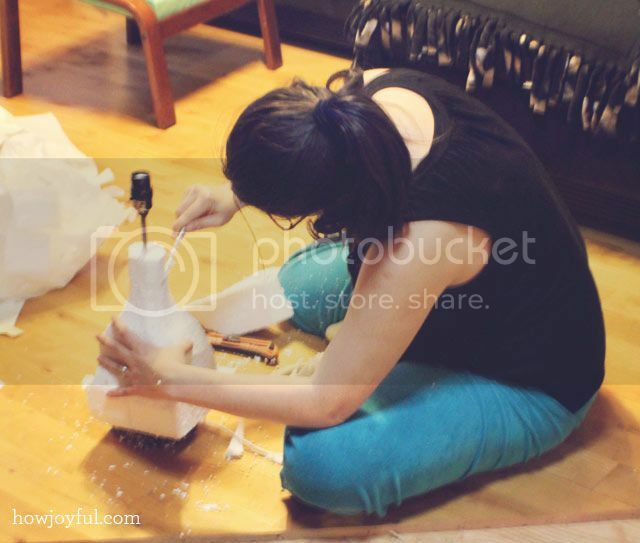 I am amazed that you made this lamp out of styrofoam! That looks so great. I like your way better than his. Wow, this is amazing, what a wonderful job you have done. Thanks for sharing, so inspiring! Must pin and FB and tweet it too! You are amazing! I LOVE this!!!! Oh wow – incredibly cool and artistic! Awesome project, I’m speechless! I’m pinning it now, but I can’t really understand how you were able to carve out this beauty! So many people have said this already, but this is completely amazing. 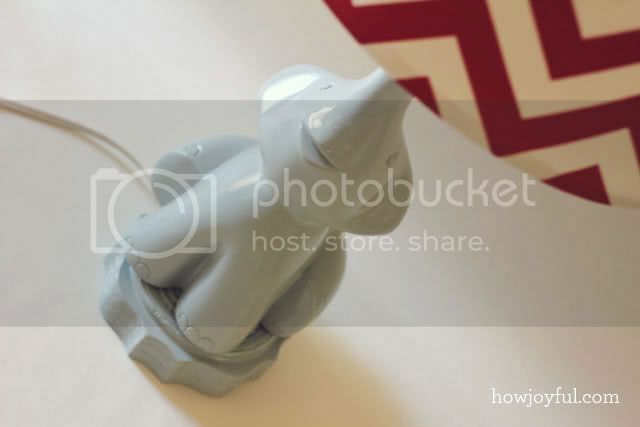 When I started reading the post I was thinking “oh where did she get the elephant to drill a hole through for the wire?”, and then I find that you made it?!?! Absolutely incredible!! Definitely something that needs pinning! This is just GORGEOUS!!!!!! Wow. Wow! It’s adorable – can’t believe you made it from scratch – thanks for showing your process. This is the cutest elephant! Awesome work! I am so amazed! I would have never imagined carving syrofoam! Your elephant turned out just beautiful! Thanks for the tutorial! most precious little thing ever! :) you have so much patience (and talent!!) im sending this to a girlfriend who is crazy about elephants! A-Freaking-Mazing! I love, love, love Jonathan Adler but hate the prices for his pieces. I like this better than his version and am so impressed with your creativity. Awesome job. 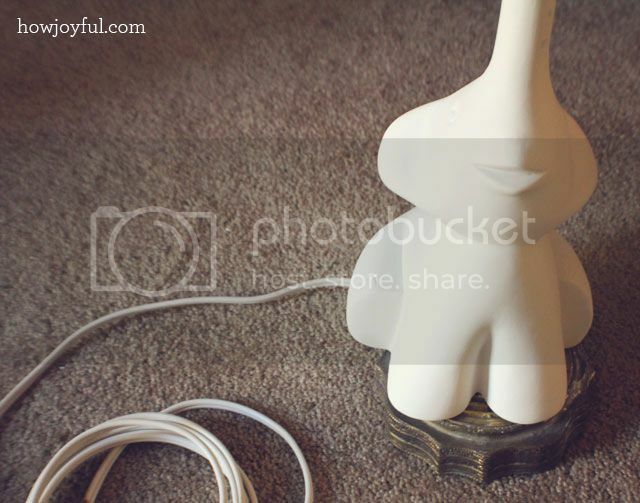 Hey, YOUR lamp is much better than the one by Jonathan Adler :) congratulations! A phantastic project! WOW – absolutly fantastic… you truely are a talented lady thanks for the inspirational blog!!! 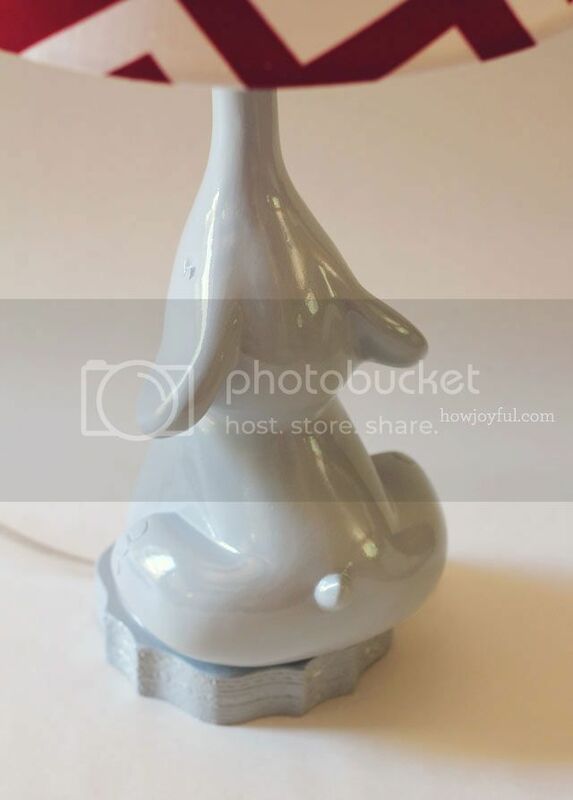 This is THE cutest lamp! I can’t wait to see what else you can do. Wow!! This is absolutely beautiful and even more wonderful because you created it with love. 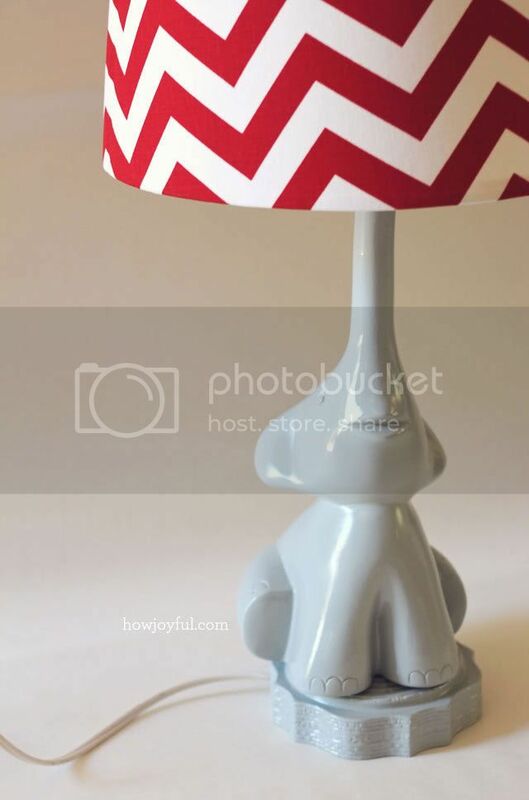 I love everything about this lamp and am dying to see how your nursery looks when it’s done! I rally would like to follow you! Hi XD i just found your blog and i loved it. BUT I DONT! really, you are really tallented, i think i’ll give it a try someday… but i dont think is going to be as good as yours… :D cya! You should sell these. I would totally buy one!!!!!!! Wow you are so talented! Job well done. I hate that i am so late in finding you only thankful that I have! I cannot wait to see how and what else you continue to up-cycle. Joy, you are AMAZING! permitime decirte que miré este post de arriba abajo, de inicio al fin.. estoy Fascinada! con tu increible talento! Tu trabajo es verdaderamente inspirador. Haz pensado en abrir una tienda? I’d pay a flight ticket to CA to be able to purchase your creations! no kidding. He descubierto tu blog de casualidad buscando diseños de ´Hot air Balloon’ y fué asi como te descubri. Quiero que sepas que admiro tu trabajo y que de hoy en más seré una lectora fiel de tu pequeño corner of the Blog-esphere. This is the most amazing diy EVER! I’m seriously in AWE of your lamp! Are you serious? I am amazed. 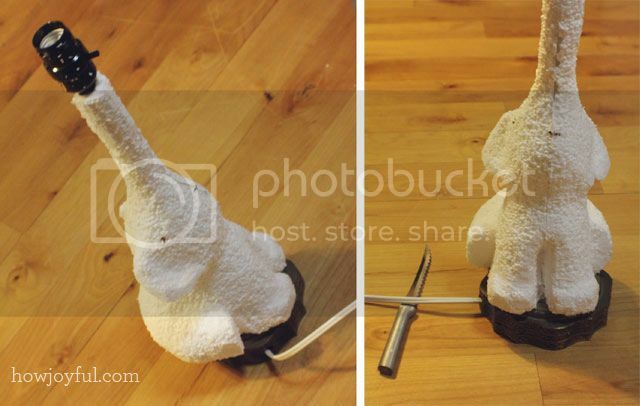 Who thinks to use styrofoam and drywall mud to create a cute elephant lamp? Maybe the art classes I took in high school were too “classic” and should have been more “crafty”! Saw your project featured at Addicted2Decorating and had to pop over to see how you made it. Amazing! you made me speechless. great idea! WOW! I love this! I looked at the same Jonathan Adler lamp and just got sick looking at the price tag, but there is just no way I would have this much talent!! I would love seriously bad to buy one of these off you…if you ever decided you would like to try this again, please PLEASE contact me! absoultely adorable! great job, mommy! absolutely adorable! great job, mommy! Is there any way to convince you to make some to sell??? I love this more than the Adler lamp, but no way I could carve and paint so well. This is exactly what I want for my nursery…..any chance? YOU ARE AMAZING! Can I buy it! There is no way I would attempt that DIY! It takes a lot of skill to make that. This is fantastic, you are so very talented. Would you be able to create another to sell? I am doing a teal and pink vintage carnival theme, and this is just too perfect. Thank you! I absolutely love this! Would totally love to buy one. If you would sell! This is SO Amazing!!! You’re really a talented artist! Love it! Same as Rebecca: if you want to make another one, please contact me!! 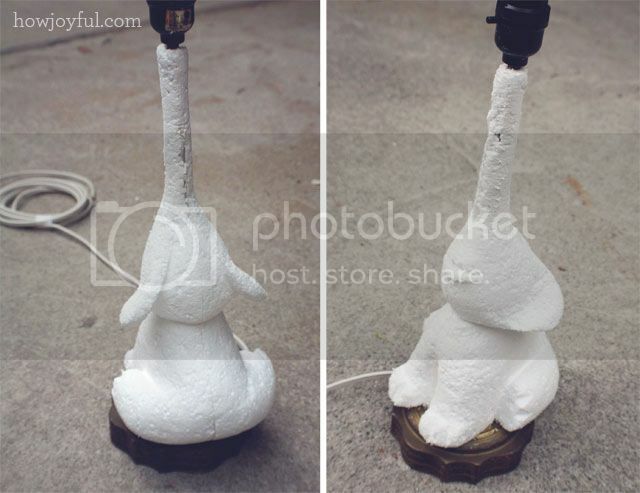 What a lovely lamp, I had no idea that you could create your own base using Styrofoam and wall-mud but I’d love to give this a try! I have just finished creating the felt hot air balloons you shared for a baby shower gift (though I opted to make felt baskets rather than use wine corks) …. they turned out lovely! Thanks so much for sharing your talent. The lamp looks fantastic! Have you sold any yet? I would be interested ASAP if you are making to sell?? Let me know please. Thanks. what a wonderful and creative idea! wow! i am soooo doing this!! any tips on how not to get styrofoam pieces clinging to you and the house, lol! thank you so much for sharing this wonderful idea. oh also, i would assume it is safe, electrically speaking? The whole room is beautiful, just gorgeous, but this lamp—wow, just amazing. I remember your wedding on WB so I shouldn’t be surprised by your talent, but I would have never guess the lamp was made from styrofoam and wall mud. Beautiful! Wow this is so amazing! Can’t believe your talent and how resourceful you are, I might attempt this sometime because my 2 year old niece name is Ellie, so we kind of word play elliephant (: thanks for the inspiration! I have just seen this. I am amazed at what a brilliant job you did creating your little elephant. It is beautiful! I would be so proud of myself if I managed to create such a wonderful piece. I am amazed! I can’t believe You shaped it with a knife! OMG, so beautiful! I would love to share this DIY at my blog if You don’t mind. May I send you all the material and money so that you can make one for my daughter? She is an elephant lover and her room is all about elephants. She would LOVE it.